THE BATTLE OF WITS AND LOGIC IS JOINED AGAIN! Following their debate over the fate of mankind, Spock and Q have continued their discussions over a meal. After dining, the two return to the stage to recount their repast, which included encounters with several of Spock's former shipmates. However, at the moment the two verbal sparring partners shake hands, a power surge places them in total darkness. Suddenly, Spock and Q are no longer on stage, but somewhere in deep space. As they struggle to determine what has happened, a curious personality change takes hold. Spock is overcome with giddy delight. Q is much more serious, even...logical. 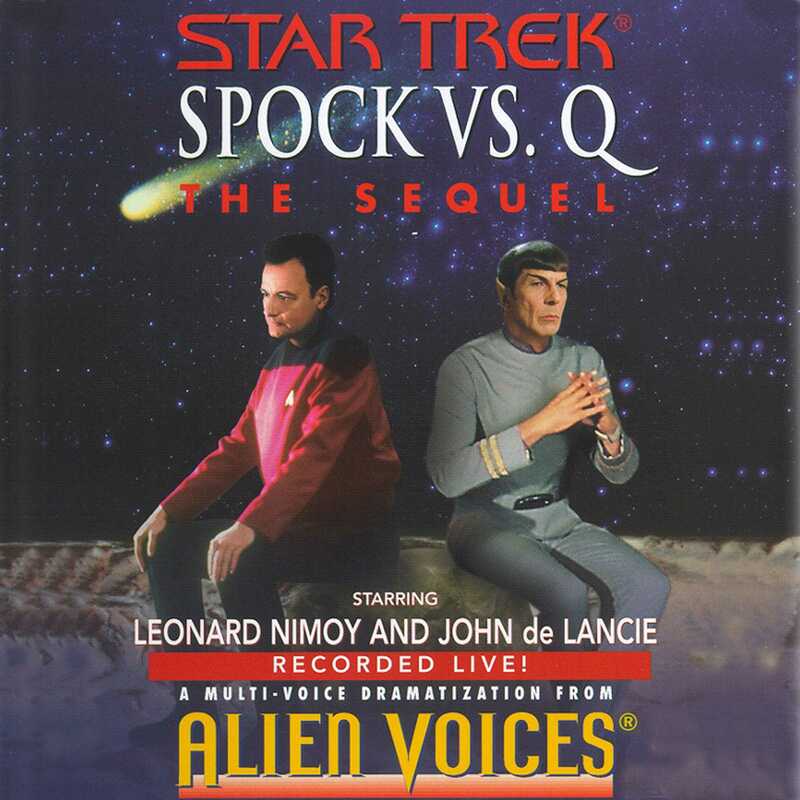 Masterfully performed by Leonard Nimoy and John de Lancie, Star Trek® Spock vs. Q: The Sequel is a fascinating and often hilarious role reversal that reveals previously unknown sides of Spock and Q. It is a program so original it could only come from Alien Voices®. John de Lancie brought Q to life in the very first episode of Star Trek: The Next Generation and has since appeared as Q in numerous episodes of Star Trek: The Next Generation, Star Trek: Deep Space Nine, and Star Trek: Voyager®. In addition, he has starred on such series as Legend and Days of our Lives. He has also collaborated with author Peter David on Q's recent "autobiography", I, Q.